As the season draws to a close, riders are bidding farewell to teammates and starting to look ahead to 2018, perhaps with a whole new team to adjust to as they complete a transfer. Others are happy and settled with an established routine, enjoying the camaraderie and familiarity of their existing team. The latter scenario is exactly what 22-year-old American Alexey Vermeulen was imagining he’d be feeling as 2017 wraps up – the Race of the Falling Leaves has been ridden, the sprinters have had a last fling at Paris-Tours…time to start preparation for 2018 with your teammates right? Not quite. Despite having a successful season by anyone’s standard, with a sparkling performance at the Critérium du Dauphiné one of the highlights, LottoNL-Jumbo have informed Vermeulen that he hasn’t been selected for 2018. ‘The Quiet American’ – Vermeulen came 3rd in the US National Championship Road Race this year. Vermeulen grew up in Michigan, and inherited his cycling pedigree from his Dutch grandfather. 2017 represented his second season at World Tour level; fittingly given his background, both seasons were with the Dutch team LottoNL Jumbo. Vermeulen is one of a host of young riders from the US who are proving themselves with some noteworthy results – indeed, American pro cycling is currently having a bit of a renaissance moment. Names like Neilson Powless, Brandon McNulty, Taylor Eisenhart and Lawson Craddock are definitely ones to watch over the next few years, with a glittering array of race results already behind them – stages at the Tour de l’Avenir, Best Young Rider jerseys at races such as the Tour of California and Tour of Utah, podium positions at Junior Paris-Roubaix…. the future for USA Cycling, which once looked to be on shaky ground, now seems to be in very good hands indeed. Compared with the exuberant Eisenhart or the creative artsy streak in Taylor Phinney, Vermeulen was once branded ‘The Quiet American’ by Cyclingnews.com. Much like Greg LeMond before him, Vermeulen is affable and polite, and only too pleased to have a chat and share his thoughts. The blog he works on during the race season is an engaging read, and Vermeulen is a good storyteller with a self-confessed ‘love for words’. Cultural differences were not the only thing the 16-year-old from Michigan had to adjust to. “European racing is vastly different from the US. It is not harder, or more intense…but different.” Alexey says. “The roads in Europe are smaller, narrower, so you race closer together, elbow to elbow – positioning is key, knowing where and when to put the effort in. Tactics play a bigger role. In the US, I view it as more of an all-out death race sometimes. At some point in the race, everyone rides as hard as possible and you see who is left. American racing creates really strong riders, some of the best time trial riders, but sometimes it can lead to clumsiness, as we do not learn from a young age how to navigate a cobble section or take on a harrowing alpine descent. It always goes both ways though; if you put a European rider in a twilight crit, he will not be comfortable. European racing at the highest level is also like football or basketball in America. While you might have a national championship road race in Knoxville, Tennessee where 25 people are watching…races like Critérium du Dauphiné or the World Championships this year in Norway see crowds two and three rows deep lining the roads for kilometer after kilometer! In Belgium during the races there are even betting boards – one of the coolest experiences ever was seeing my name on the top of the board before a kermesse when I first started racing over the pond when I was u23”. The cool experiences keep rolling in, with Vermeulen now riding alongside cyclists who inspired him when he was breaking into the sport. “Growing up I was inspired and motivated by Taylor Phinney. I found his drive and his quirky habits to be interesting and something that I could relate to. I always read about Taylor in Velonews or saw him in the press. He worked harder than most people I knew, and he was just perfectly older than me where I was always looking up to him and could use him as a carrot. Still to this day I see him as part of my cycling career. 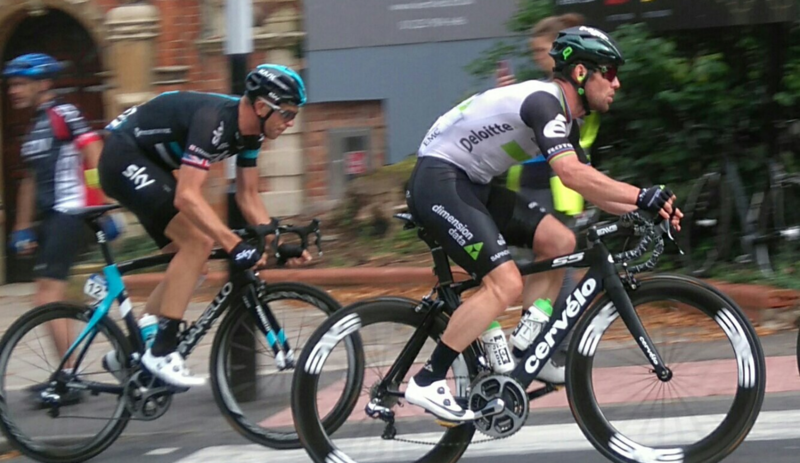 Another rider I admire is Mark Cavendish. I watched him win in Copenhagen at my first World Championships where everyone said it was too hard for him. He has overcome more adversity in 10 years than most men do in a lifetime”. As well as looking up to riders in the current peloton, Vermeulen is also fully versed in the fascinating backstory of cycling, its amazing feats of endurance and the compelling characters who achieved them, declaring Gino Bartali as a great inspiration. “Reading about Gino made me realize the grand history of the beautiful sport that I am competing in, and that it was not always as easy as just going out to train. Gino still holds the largest gap between two Giro d’Italia wins”. There’s just time to quiz Vermeulen on his hopes for the future before stomachs start rumbling…..
“Short term I’d love to start and finish my first Grand Tour. Long term the goal is to go to the Olympics… LA 2028 would be a dream after missing out on the World Championships in Richmond with a broken wrist”. Well, racing up the Col du Tourmalet or the hairpins of Alpe d’Huez looks pretty darn hard to me. Best fuel up with some good food first….did someone say banana bread or rice pudding? This afternoon one of the most spectacular races in the calendar begins close to the Arctic Circle. Here’s your guide to the Arctic Race of Norway, with thanks to Eliot Lietaer of Team Sport Vlaanderen-Baloise, who’ll be lining up on the start line today. What is the Arctic Race? A fairly new addition to the race calendar, the Arctic Race was first held in 2013 as a category 2.1 UCI Europe Tour event. From 2015 the race was classified as 2.HC. Fittingly, the inaugural edition was won by the Norwegian Thor Hushovd. Hushovd continued to be involved with the event as an official race ambassador. The route this year is made up of 4 stages, each designed to accommodate different styles of rider. This is a theme in the Arctic Race of Norway – to date we’ve seen overall victories going to a sprinter (Hushovd), climber (Kruijswijk), GC rider (Taaramaie) and Classics specialist (Moscon). Last year, Team Sky’s Moscon took home 500 kilograms of fish as well as the winners Blue & Orange Jersey! The riders will cover a distance of 680km over the 4 stages of the race, cheered on from the roadside by enthusiastic fans, and cycling through some of the most spectacular scenery seen by the professional peloton. “Norway is a really nice country to race in” explains Eliot Lietaer of Sport Vlaanderen-Baloise, who is competing in his second Arctic Race. “The roads are really good, the hotels are nice – always good WiFi – and there are very friendly people cheering at the side of the road”. The route this year is well suited to Lietaer’s style of racing, comprising one real climbers day, two for the sprinters – one a pure sprint day – and a rolling stage perfect for puncheurs, which includes some sharp climbs to test the legs. “I’m really looking forward to the Arctic Race of Norway this year because it really suits me – three relatively flat stages and one mountain top finish where the GC will be decided and where I can show my real strength”. Lietaer thrives in situations like this, and coming off the back of a great showing at the Vuelta a Burgos, don’t be surprised to see him mixing it at the sharp end. “I prefer stage races as I do very well at them. My recuperation is very good at the end of a stage race, and I’m still feeling strong and can go for a good result. The Tour de Wallonie and Vuelta a Burgos were my goals for the season as well as the Arctic Race – after that I’m only racing a few one day events. I hope to do well as I have ambitions to ride for a WorldTour team next year, so every race counts”. What can we expect to see over the 4 days of racing? Amazing scenery, Norwegian flags and some great racing! Day one sees the riders starting the race on the island of Andorja, and utilises a finishing circuit last seen in the 2015 edition of the race. 5km before the finish line, the riders will reach the summit of the Skistua climb, which covers 2.3km at an average of 6.6% gradient. The pure sprinters will be eyeing up day two, which starts at Sjovegan and uniquely finishes on the runway of the airport at Bardufoss. Stage three is the day for the climbers, with the route heading into the spectacular Lyngen Alps for a summit finish in Finnvikdalen, after 4km of climbing with a 5.5% average gradient. The forth and final stage starts and finishes in the Norwegian city of Tromso, encircling the settlement with a loop of 118km before tackling three laps of a 13km finishing circuit – including some pretty punchy climbs to ignite the GC competition. The Arctic Race of Norway has a bit of a cult following, and its position in the race calendar makes it an attractive prospect before the Vuelta. Fresh from victory at the Tour of Poland, BMC’s Dylan Teuns is confident he’ll be able to perform well. Teams at the Arctic Race are made up of 6 riders, with some, like Dimension Data, choosing to take one or two stagiaires to increase their race experience. WorldTour teams Dimension Data, Astana, Sunweb, Katusha-Alpecin and Teuns’ BMC will be on the start line, and there’ll be a strong local contingent with a number of Norwegian teams taking part. “There are a lot of Norwegian teams competing with a lot of talented guys who are really motivated” explains Lietaer. The race leader will wear the Blue & Orange Jersey, with a Green Jersey on offer for the Points Classification, and the so-called ‘Salmon’ Jersey (a sort of orange colour) for the King of the Mountains. Prizes are also rewarded to the ‘Most Active Rider’ of the day, and to the best placed team on GC. Newly crowned European champion Alexander Kristoff will want to continue the winning streak he started at London-Surrey – especially on home turf. Dylan Teuns of BMC is the Freewheeling pick for the GC however, and don’t count out Rein Taaramäe, the overall winner here in 2015. Eurosport 1 will show live coverage from 4-5pm BST. This footage will be repeated on E2 at 7pm.